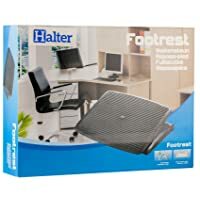 ⭐PREMIUM FOOT REST: Rest your legs in your office while working, or at home after a long day. ⭐ ERGONOMIC DESIGN: Ergonomic design provides a tilt angle up to 20° & increases comfort, keeps legs & feet levitated and takes away stress & fatigue. ⭐ NON-SKID SURFACE: Large Platform Surface (13.8" X 17.7") texture provides a non-skid surface for your feet to rest on. Perfect for office & home use. ⭐ TOP QUALITY: This ergonomic foot rest is made of high impact polystyrene for a sturdy & stable feel. ⭐⭐⭐⭐⭐ CUSTOMER SUPPORT: We, At Halter, Offer Not Only Top Grade-A Quality Products But Also Provide Top Of The Line Customer Service Along With Our 1-Year No Questions Asked Warranty Policy Which You Won't Get With Other Brands.